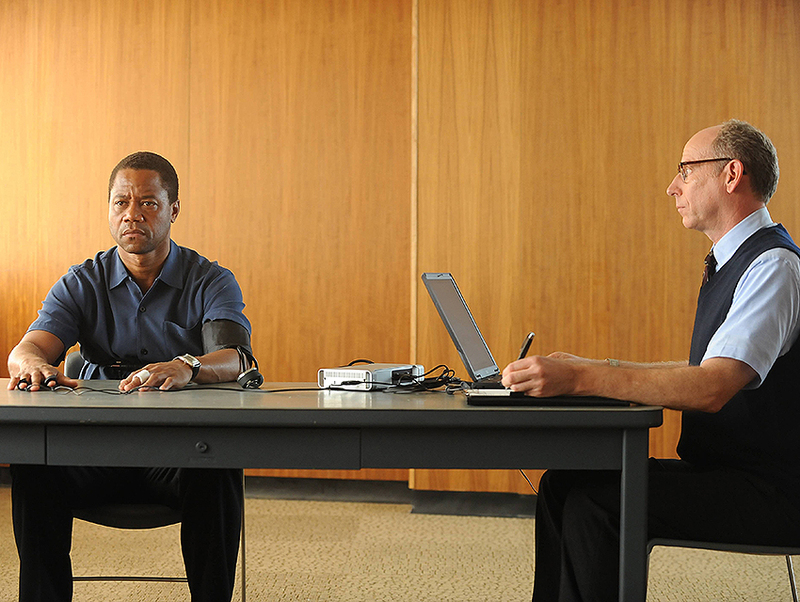 Scott Alexander and Larry Karaszewski, the writers behind The People vs. Larry Flynt, Ed Wood, and Man on the Moon, have finally brought their biopic expertise to the small screen: They are the creators of FX’s American Crime Story: The People v. O.J. Simpson, the first installment in an anthologized companion series from American Horror Story creator Ryan Murphy. But bringing what was widely regarded as the “trial of the century” to television was no small feat—here the pair discuss striking a balance between the tragedy of murder and the absurdity of the media, how the case influenced the world of reality TV, and the gender-specific undertones of the case. Why did you choose the O.J. Simpson trial to launch the inaugural season of American Crime Story? Scott Alexander: It’s less reverse engineered than you think. [Producers] Brad Simpson and Nina Jacobson got the rights to Jeffrey Toobin’s book, The Run of His Life, and our agent called us up saying, “I know you guys have never done TV, but Brad and Nina have the rights to O.J. as a miniseries. What do you think?” We looked at each other and said, “We’re in!” You have got so many crazy, interesting characters, you’ve got so many themes—the story is rich and fascinating and unpredictable—and so we jumped aboard. We had dallied with the idea of doing a TV show for the last two years, and every time someone would come to us with a proposal, we would always circle back to miniseries as a format that we found appealing. Larry Karaszewski: To your bigger question as to why we said yes so quickly, we thought the story was insanely great, and we would never have done it as a movie. A movie would have been two hours, and you would have told all the things that everyone already knows. But having ten hours allowed us to explore all the rich details and the various characters and the themes. What’s amazing about this case is that it really is a Los Angeles story. Scott’s a local boy. He grew up in Brentwood. It’s often a cliché when someone says,“I can see the city as a character,” but in the O.J. story, it really is. We have the downtown courthouse, the freeways, Brentwood, the canyons, Bundy, Mezzaluna—we were so happy we got to shoot it in Los Angeles. With all of this runaway production, it was a battle at times to keep such an expensive project here. But you can’t shoot this anywhere else. There have been a couple cheapie TV versions done in the ’90s; two minutes in and you’re like, oh, hell, this is Vancouver. This is a fraud. I can see how that would be an issue. It is cliché, but I mean, how do you not shoot that freeway chase in Los Angeles? SA: I brought up Kato Kaelin. He’s a quintessential L.A. character, and to show him jogging in Santa Monica says so much. I went to Palisades High, so I know the area, and to me, the Santa Monica bluff on Ocean Avenue, looking out over the water, is the kind of iconographic image you can only have here. You would not be able to create that image anywhere else in the world, and so to capture all the flavor of the city was really cool. Brad Simpson has said the ambition of the show is not to replay the events of the trial but to show us what was going on behind the scenes. With that in mind, what was the adaptation process like? Was it hard to take a more serious tone when the trial is widely regarded as having been a media circus? SA: The tone was sort of predestined when we came aboard in that there’s a tone that unifies all of our biopics. We believe that movies don’t necessarily need to belong in the drama section or the comedy section or the melodrama section. We feel that life is messy and that the really great movies try to mix seriousness of purpose and social commentary and comedy and absurdity and humanity. The movie that this show resembles most from our past would be The People vs. Larry Flynt. We were swinging for the fences in trying to say something about the influence of free speech in America while telling a completely crazy story. There was a lot of sadness and a lot of comedy. LK: The reason we’re so attracted to these bizarre true-life stories is that truth is stranger than fiction. The reality is so strange and outlandish that it makes for such fascinating material. The O.J. Simpson trial doesn’t play by any rules whatsoever; all these characters are pushing other people out of the way to get into the spotlight, but underneath it all is this horrible tragedy of these two innocent victims. When we first began, Scott, myself, Brad, and Nina would spend days having these kind of salons where we would get together in a room and talk about big things: the aspects of race on this case, the aspects of class, the differences between the rich defense attorney and the regular prosecutors. 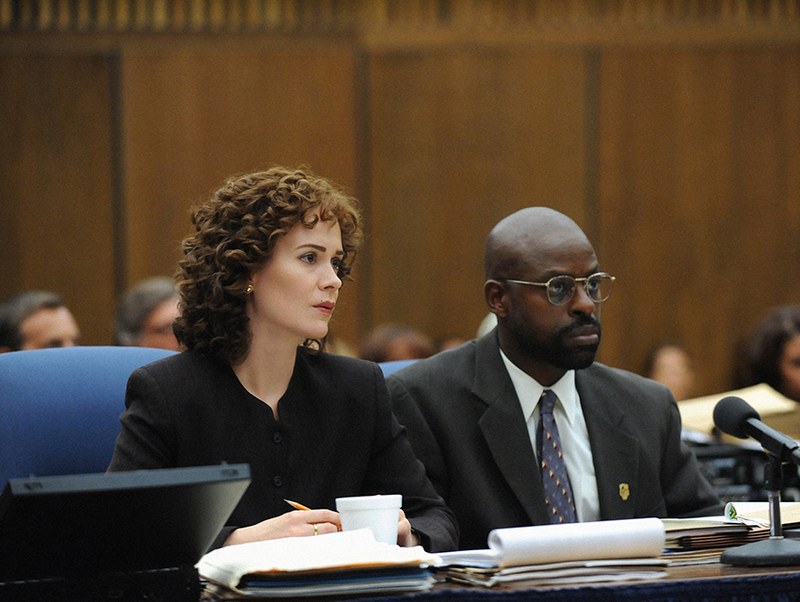 Also the aspect of gender, which is one of the things that almost no one looks at in terms of this case—how hard Marcia Clark had it during this trial. She was the only woman up there, and she had to put up with opening a newspaper and people making fun of her hair. SA: And she was dealing with the struggle of being a single, working mom juggling two little kids. She’s in the middle of a divorce, so she’s running back and forth from divorce court to the criminal building. These are the sort of personal difficulties that would make any kind of a normal, 40-hour-week job hard. And she was working a thousand hours a week under the glare of every TV camera in the world. LK: The socioeconomic disparity between the two sides picks at one theme, which we had never seen discussed anywhere. This was something that came out of our discussions: It’s easier to be a highly paid criminal defense attorney when, if you’ve got a rich client, you can hire as many assistants, paralegals, and investigators as you need. It was an open checkbook situation. Whereas the DA’s office, they’re civil servants. They aren’t going to the fancy dinners, the big premiers. They don’t have the fancy outfits that the other side does. They had to take their work home with them every night. Marcia and Bill Hodgman and Chris Darden were lugging home hundreds of pages every night while Johnnie and Shapiro could go out to Spago, and cumulatively, that can really wear a person down. SA: The other aspect we found kind of interesting was the celebrity. This case made the 24-hour news cycle, and one side was really prepared. Robert Shapiro, Johnnie Cochran, F. Lee Bailey—these people are pundits who use the media to their advantage, whereas Gil Garcetti’s team had a certain awkwardness when it came to TV. They were at a huge disadvantage. LK: In terms of media, we look at the 24-hour news cycle and the beginning of reality TV—people becoming famous for no reason. 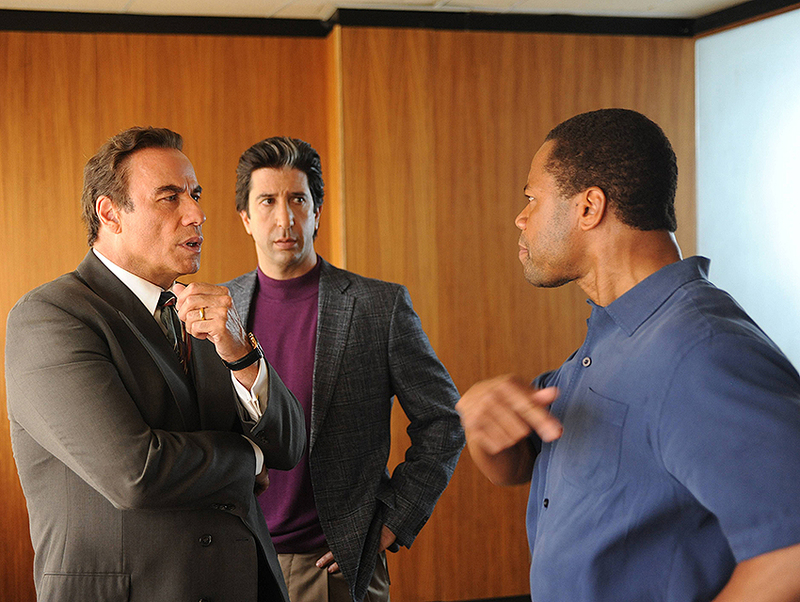 You can look at a pre-O.J. and post-O.J., and they fed into each other. CNN and Court TV were fairly new ventures desperate for programming. Someone realized they could just run O.J. around the clock, and it was getting ratings around the clock. The big three networks, incredibly, started saying,“Why should we pay to produce General Hospital when there’s a better soap opera going on in downtown L.A. everyday for free?” They put all the daytime programming on hiatus. Kris Jenner divorced Robert Kardashian six years before the acquittal took place, and she didn’t testify. Was the birth of this reality TV universe part of the reason you included her throughout the series? SA: Selma [Blair, who plays Jenner] is in either three or four scenes—about five minutes of the ten hours. Robert was the character who snuck up on us. We originally thought it was going to be the Marcia, Chris, Johnnie, and Shapiro show, but when we were delving into the research, we found Rob Kardashian was fascinating. He was the only character in the carnival who wasn’t looking out for himself or trying to promote his own agenda. Everyone else had something to gain for their career, for their freedom, for justice, for their murdered family members—he was there simply because he was a very religious man and a very faithful man. He and O.J. went all the way back to college. O.J. and Nicole and Kris and Robert were extremely close. They socialized together, and the families would take trips together. Even after the mutual divorces, they all stayed in touch with each other. Robert and Kris had a very amicable divorce. I think she said the only arguments they ever had after the divorce were about Robert taking O.J.’s side in the trial. Robert looks O.J. in the eye and says, “Did you do it?” and O.J. says, “No.” And even though Robert could see all this evidence around him, he chose to stand by his friend because Robert was a man who believed in God, and he couldn’t have fathomed a universe where his best friend could look him in the eye and lie to him. And so we thought his utter loyalty would ground the show with a serious and a heartfelt quality that no one else had. And then we realized we could sort of invent a moment where the kids see their father on TV. The event really happened—Shapiro forced Robert, who was not a public figure at all, to read O.J.’s suicide note on television—and we said, “We could have the kids see this and get excited to hear their name on television.” It’s a very quick nudge where we could say to the world that this is the murder scene that ended up inventing the billion-dollar empire. It works as metaphor for what the trial became: this carnival of personalities. And then it turned into Johnnie’s referendum on the LAPD. It became about television and celebrity and fame and everything except the two victims.